Radical innovation has historically overcome barriers to scientific progress. For example, the discovery of pi as a numerical concept found application in mathematics, physics, signal and image processing, genomics and across domains. Similarly, the internet unleashed innovation across industries. Today, the computing world stands at a point where “pi”-like innovations can unlock quantum value. Enterprises spend $2.7 trillion on technology related products. More than 95 percent of that spend is driven by desktop or laptop related applications, services, networking and data center infrastructure for employees, partners and customers. 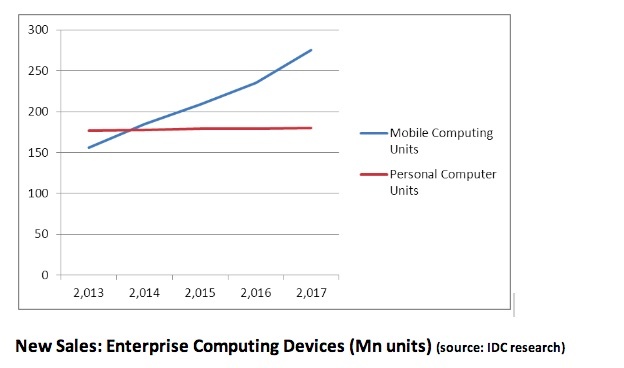 Amongst enterprises, there is an installed base of 700 million personal computers, while smartphones and tablets form an installed base of 400 million mobile computing units. 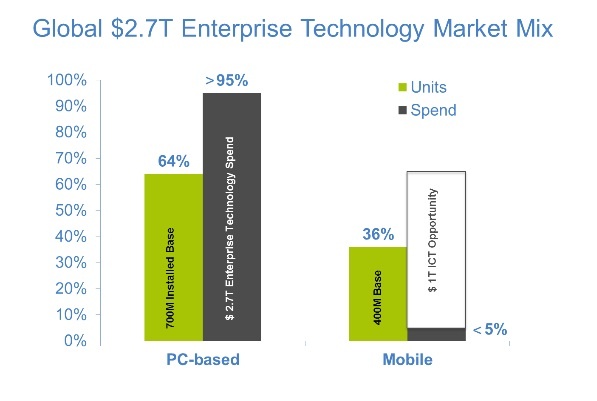 While mobile computing units constitute 36 percent of devices, less than 5 percent of enterprise dollars are focused on the mobile device base highlighting a disproportionate dichotomy. New sales of mobile computing devices will grow from 150 million to an estimated 235 million new units per year by 2017. However in 2017 only an estimated 180 million laptops or desktops will be sold that year — and the growth in those machine sales is flat. Meanwhile 3G connections will grow to 6 billion by 2017 and faster 4G connections will grow to 800 million connections. As per Cisco, smartphone broadband speeds will triple to 6.5 Mbps. Building on those speeds, Forrester forecasts the applications market for mobile computing will grow at 124 percent compound annual growth rate to reach more than $20 billion by 2017. These leading indicators highlight a transformation in enterprise technology architecture: The massive shift from PC-based computing to smart mobile computing. Yet, barriers to larger adoption and innovation remain. A key barrier is the evolving mobile computing landscape with multiple form factors and operating systems. For example there are operating systems such as iOS, Android, RIM, Windows, Symbian as well as new launches as Firefox, Ubuntu and Jolla. This is in contrast to personal computing on laptops and desktops where 95 percent of devices have Windows OS. 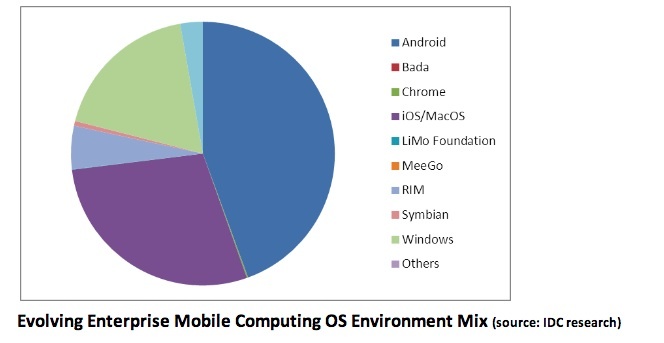 There is no single “OS for the enterprise” on the mobile side. Another barrier is lack of talent and best practices in smart mobile computing that will lead to low returns for early adopters and create disillusionment. Most mobile apps replicate portal functions and do not make use of the true points of differentiation a mobile device can offer. They don’t take into account customer insights, use cases or build upon mobile functions such as real-time social computing, location, personalization. A survey of CIOs indicate that more than two thirds of North American and European insurers will increase investment in mobile applications, however Gartner predicts that lack of alignment with customer interests and poor technical execution will lead to low adoption rates. In fact, Gartner expects that by 2016 more than 50 percent of the mobile insurance customer apps will be discontinued. For those that have found a killer mobile application use case, it is difficult to manage the evolving traffic, real-time data access and heavy computing requirements. Imagine having access to your company’s intranet on a mobile device. An employee will access programs, news and blog maybe ten times a day in a socially connected enterprise vis-à-vis once a week on a personal computer. A single use case may drive 10 to 50 times the traffic. Executives will check real-time performance and provide directives, or supply chain participants will check inventory and replenishment data and make work orders in real time. The mobile architecture updates data on every opportunity to access the network as opposed to a “pull-based” mechanism on personal computer. If 10 percent of your use cases migrate to mobile, they may generate as much traffic as the rest of your 90 percent web-based use cases. 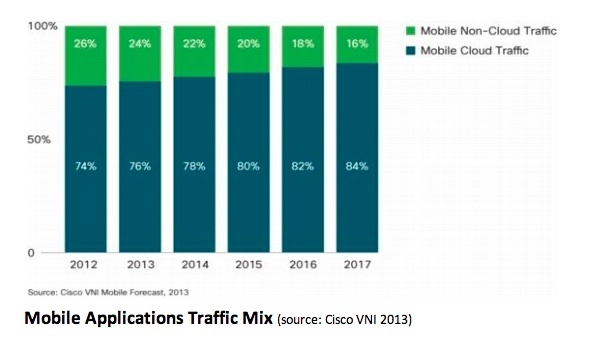 Because of the potential to crush a staid IT infrastructure with more data requests occurring more often, 75 percent of consumer mobile traffic is served from the cloud which can scale reliably as usage spikes. Yet, unlike consumer applications such as search or games, corporate IT systems have a legacy rigid architecture design that is a key barrier to realizing the potential of smart, mobile computing for the enterprise. Don’t try to bridge legacy and mobile IT. Rethink it. Not only business data, but the applications on the device or infrastructure software in the cloud will be upgraded frequently. On average Amazon provisions 10,000 to 30,000 hosts per second – a 200 percent variability. Force.com works with new partners to complement offerings or industry solutions and with Force.com enhancements, partners have to update data stacks and release new versions. Apple serves 30-to-40 percent of global internet demand during an iOS upgrade. As Apple’s IT systems cannot provision for such peak demand, it dynamically scales relying on partners — and so will enterprises need such software-defined IT systems, networks and partners that can auto-provision and scale to serve smart mobile computing. Individual enterprises are applying resource-intensive mechanisms to solve smart mobile computing issues for compelling use cases. But there is wider opportunity for ecosystem players to innovate across applications, algorithms, protocols, and architectures as opposed to doing so in a one-off fashion. Innovative startups are attempting to solve issues with cloud applications, tools for mobile device management, application development or M2M platforms. However most are focusing on a point solution with incremental innovation constrained by lack of ecosystem readiness. They are not rethinking the way legacy enterprises need to address the mobile world. At the other end, incumbent ICT players are investing in mobile solutions to defend existing revenue and relationships or for sustainable growth. As an analyst puts it, enterprise mobile applications and architectures do not dance yet. If you attempt to connect discrete private cloud infrastructures and link them to public cloud, as industry experts recommend, it would be like ascending to Mount Everest. The network recognizes links and tracks traffic flows, but cannot differentiate between users, applications, or workloads. The leading vendors have significant investment in current designs, and are unlikely to adopt radical approaches or refocus their R&D. Here lies the opportunity for niche players, “intrapreneurs” at large incumbents, research units at universities or start-ups to pursue radical innovation. You can bridge the legacy enterprise and mobile world or you can utterly rethink it. You should rethink it. Much like the cloud helped democratize the world of enterprise IT — letting startups such as Salesforce become big names, the rise of mobile in the enterprise will only accelerate that trend. Developing mobile applications that pull in the work of others via APIs lets smaller companies build enterprise-grade features and products from any part of the world. As innovations such as 3D printing and machine to machine communications disrupt established industries with new business models, an enterprise that has adapted smart mobile computing can lead the way without its legacy IT holding it back. The flexibility of these new mobile-oriented platforms will shape digital ecosystems, much like the rise of the client-server model shaped the last thirty years. Building on models possible through smart mobile computing, digital ecosystems will drive industries as healthcare, education, transportation, utilities and even public services as law enforcement, civil management or democratic processes. Radical innovation is required to make a quantum leap forward. Indeed, the computing world needs “pi”-like innovations that can anticipate and personalize use cases, find insights in terabytes of unrelated data, compute and store infinite data sets, create resilient intelligent networks, and self-healing security systems. A “pi” that can inspire imaginations and not only solve hitherto unsolved problems, but can transcend the digital ecosystems to solve problems we have not yet thought of and change the world. Nirav Shah is a senior strategist and innovator at global service provider Tata Communications based out of India. When he is not building strategic plans, he finds amusement studying shifts in customer behavior, profit pools and technology. The views expressed here are his own. Nice post about the radical innovation required in IT. Nirav Shaw from Tata Communications suggests building a hybrid cloud environment would be akin to ascending Mount Everest for most IT shops. I think there are some valid points here. This will sound self-serving (I work for VMware) but this is why VMware’s approach to hybrid cloud makes sense. Take your current tools and processes and extend into the VMware public cloud, rather than build brand new processes and architect new technology stacks. Solution discussions aside, the salient point here should be that IT *must* change. A lot written here is true though enterprise world is vast. It would have been good to see some break down. For example I have worked as consultant for power company and they do not have any incentive to move fast on this. They will wait and follow once something is proved. I believe this is because there is zero competition for a utility company and they also know that there is no way they can go out of business.